SICK has announced it has launched stainless steel versions of its fully-programmable DFS60 incremental encoders and AFM60 and AFS60 absolute encoders making them available for duties in hygienic and corrosive environments for the first time. 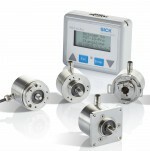 The company says the SICK DFS60 Inox, the AFM60 Inox and the AFS60 Inox programmable encoders feature a rugged stainless steel housing, flange and shaft and they deliver high-resolution, precision performance in aggressive environments such as chemical washdown, salt and high humidity atmospheres with an operating temperature range from -30°C to 85°C. The SICK DFS60 Inox is a high-resolution, 16-bit incremental encoder, the AFS60 Inox absolute single turn encoder has a high resolution of 18 bits, while the AFM60 Inox absolute multi-turn encoder has an even higher resolution of 30 bits. Increasingly components are expected to operate efficiently over longer periods of time and OVAKO says its engineering steels can facilitate production advantages with time and cost savings along with improved safety and operational life. Ovako says the latest wear resistant WR-Steel and next generation M-Steel were on show at MSV Brno Trade Fair and both offer manufacturers significant production advantages. BEKA says its new timers and clocks simplify process timing in both hazardous and safe areas, are able to display elapsed time between events, or control external devices, and cycles can be repeated continuously or a specified number of times. Beka says as a clock the instruments display local time in various formats and two sizes of panel mounting instrument with IP66 front of panel protection and a rugged 316 stainless steel instrument for applications in severe or marine environments are available.